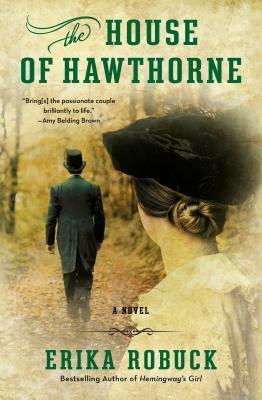 My take: The House of Hawthorne is the story of Nathaniel Hawthorne and Sophia Peabody Hawthorne. She was a painter and he, of course, a writer. Erika Robuck’s novel takes the reader from Cuba to Massachusetts to England to Italy and back to Massachusetts. Their daily life included visits by people such as Emerson, Thoreau, the Alcotts – to name just a few. The House of Hawthorne is a story about love between two people who understood the other so much so that words were not always necessary. That’s not to say life was perfect or easy. Sophia had health issues and he seemed to suffer from occasional bouts of depression. They struggled financially most of their lives and yet managed to travel and live where they chose. There were times of great joy and deep sadness and their relationship carried them through it all. I loved learning about the Hawthornes. I knew virtually nothing about Nathaniel other than his books. I think Robuck probably got to the core of his true character – at least it felt that way to me. He was very fortunate to find Sophia and that she returned his love and admiration. Not all marriages at that time were a love match and these two appreciated that theirs was. It’s what held them together, I’m sure, when life was hard. For some reason the book had a slow start for me but after several pages I was swept up in the story of Sophia and Nathaniel. I think fans of historical fiction and 19th century American writers would like The House of Hawthorne as much as I did. I was grateful for the Author’s Note that brought me up to speed with the Hawthornes at the end of the book. I’m also curious about their son Julian’s book about his parents that is listed in the bibliography.